Free April Printables, NAPCP Gatherings, Articles Youâ&#x20AC;&#x2122;ll Love and More! renewal, new life, and an invigorating time to enjoy the natural world. We couldn’t agree more! This month, during this blissful season, we invite you to spread your NAPCP wings. Take your membership to a deeper level by applying for 2018 NAPCP Ambassador status. Whether you want to lead or mentor new photographers, want to bring together amazing business minds, or simply wish to nurture your local creative community, apply now! Elevate yourself in our association and industry! Visit the NAPCP Ambassadors page for more information, including the application. Applying will put a spring in your step. 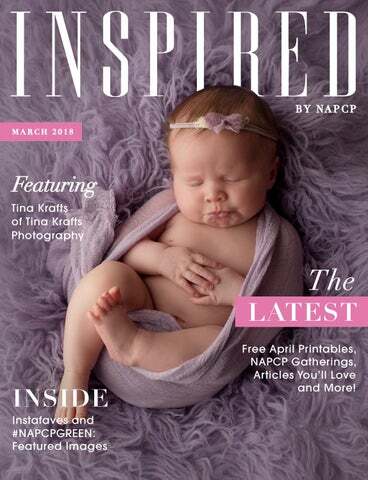 uplifting words from Tina in the NAPCP Member Community Facebook Group, or perhaps you were as blown away as we were by her recent blog post showing a behind-the-scenes look at newborn image retouching. Tina has nearly always had a camera in her hand. When her children were born she felt compelled to study and master the technical aspects of photography, and so began her professional journey. Now, Tina is a twotime NAPCP International Image Competition award winning photographer, as well as the recipient of a WPPI Image Competition Silver Award. A strong voice for education and safety in the newborn photography industry, we adore Tina not only for her commitment to her craft, but for the light she brings to professional photography as a whole. We are so happy to share Tina Krafts, of Tina Krafts Photography, with you. Competition judges are hard at work, beginning to score and critique your wonderful images! We want to remind you to not let our next competition, the NAPCP Inspired Gallery Event, sneak up on you! The purpose of this event is to inspire the creativity of NAPCP members and photographers around the world, while also providing an environment of collaboration and education. Entering your work into the NAPCP Inspired Gallery Event & Print Competition provides you with the freedom to express your most creative self. Learn more here! Digital entry submission opens in July. including Jenna Martin’s social media marketing class, and a headshot session marketing set perfect for spring! These items were assembled, designed, and written with you in mind. Get into the swing of things, and hop into the shop! Napcp Store Donâ&#x20AC;&#x2122;t forget to get your Spring Marketing Postcard Pack! Use these postcards to remind your clients to book for Spring and Summer! The set includes 8 unique postcard designs perfect for engaging your returning clients. Get started now! portrait photographer specializing in custom portraiture of newborns, children and families in the Maryland, Washington. D.C., and Northern Virginia metro areas. For as long as she can remember, and as Tina’s friends and family can attest, Tina Krafts has been obsessed with taking pictures and has nearly always had a camera in her hand. It wasn’t until her children were born, however, that she felt compelled to study and master the technical aspects of photography – to develop the knowledge and skills necessary to match her lifelong passion for photography. As a mother, Tina knew that she wanted more than a nice picture of her children’s sweet little faces; she wanted to capture their personalities and spirit — their silliness, their sweetness (and, at times, their sass), their curiosity, their boundless energy, their sense of wonder, and their love for each other. Tina wanted to capture them on film the way she knew them in her heart. Thus began her journey as a portrait photographer. It brings Tina incredible joy to photograph babies, families, and children of all ages. Tina strives to produce, for each of her clients, authentic images that capture the unique qualities of their loved ones – the same sort of images that she desires for her own family. Keep reading for more about Tina Krafts! 7. Favorite subject to photograph? newborns; my kids 8. Favorite musician? Bruce Springsteen 9. Favorite movie? Napoleon Dynamite; Parenthood 11. Recent favorite read? Born to Run 12. Favorite client product? wood photoblocks 12. 3 things you canâ&#x20AC;&#x2122;t live without? My family, espresso drinks, and the internet. F L I P T H E PA G E F O R O U R E XC LU S I V E I N T E RV I E W W I T H T I NA ! Congratulations on being our feature NAPCP photographer this month, Tina! Please tell us about yourself and how you got your start as a professional photographer. I am a portrait photographer specializing in custom newborn and child portraiture in the Washington, D.C. metro area. I am also a wife, a mom to two wonderful daughters, and an attorney who never gave up on my dream of a career in photography. (I practiced labor and employment law for 17 years before starting my photography business.) For as long as I can remember, I have carried around a camera in my hand, and have been obsessed with documenting memories. (My friends and family were accustomed to hearing me say, “Trust me, you will appreciate it later” in response to their protest of my requests to take “just one more photo.”) It was the birth of my girls, however, that really inspired me to learn the technical aspects of photography and to fully immerse myself in the subject because, naturally, I wanted to be able to capture beautiful images of my family. I took many evening classes at both a local photography school and online, read all that I could, and practiced in all of my free time. Around the same time, I was fortunate enough to have become friends with a talented local photographer who was incredibly generous with her time and knowledge, and she gave me the encouragement I needed to pursue this creative passion as a profession. Do you have a favorite photo? Will you share it with us, and tell us a little bit about it and why you love it? Although it is hard to choose, this image (bottom image pg 14) is probably my current favorite. I just adore this little guy’s sweet little smile, and I think that the sage green color compliments him so well. I also love everything about fall, so I was very excited when his parents asked to incorporate some elements that reflected his fall birthday. We are in love with the movement you capture in your personal images of your daughter. What are your tips and tricks for getting those shots consistently? Thank you! My daughter is always moving – spinning, flipping, leaping, cartwheeling, handstanding , etc. -- and, as she has gotten older, she has become much more reluctant to pose for me. However, she is happy to have me photograph her doing what she loves, and I, in turn, love to capture her in her element! I have learned to always have my camera at the ready, whether in the house or out and about, and I will often suggest outings to locations at which I know she can freely dance or tumble. In terms of capturing the actual images of my daughter in motion, setting my camera to a very fast shutter speed is critical! I also typically move with my daughter, testing out the best positions and angles to capture her motions. Will you share a few words of wisdom for photographers who are just beginning their business and may not have found their specialty or “true love” quite yet? Above all else, I suppose my advice would be to continue to experiment and explore, and to overcome the fear of trying new things. After all, you will never know if you will like or dislike something until you try it! When I first started out in my business, I was primarily photographing children and families, and I remember telling a friend that I wasn’t interested in photographing newborns, mostly because it seemed quite difficult, and somewhat frightening, to comfort and pose fragile new babies (even though I had had two babies of my own). But when a friend of a friend asked if I would photograph her newborn, I agreed, and simultaneously committed myself to learning everything that I could about newborn photography (with a particular emphasis on safety!). After just one session, I was hooked. Honestly, I didn’t stand a chance against those baby snuggles and the love that is evident on the faces of new parents and older siblings! Newborn photography ultimately became my passion and specialty, and now I can’t imagine doing anything else! 1- Educate yourself. Although education is important to every genre of photography, it is absolutely critical for newborn photography. Of greatest importance is training in the safe handling and posing of newborns. In my view, no photographer should accept a newborn client without first receiving such instruction. Many established, reputable newborn photographers offer workshops providing this type of training, and there is a plethora of additional resources available, including books, websites, and online forums. 2- Prepare parents for what to expect. New parents are often, understandably, exhausted and stressed. Providing them with information about what to expect during the course of their portrait session and answering any questions upfront will undoubtedly ease their minds and make the entire experience more comfortable. In addition, providing parents with tips and recommendations for preparing for the session – including information about what to bring, what to dress the baby in, and when to feed the baby – can maximize the potential for a smooth portrait session. 3- Use tried and true techniques for soothing babies and keeping them asleep. Although all babies are different, there are certain steps you can take to set the stage for a successful newborn session. For example, turn up the heat and/or utilize space heaters to keep the temperature comfortable for baby. Invest in a white noise machine or a Baby Shusher. And if the baby isn’t sleepy when she arrives, swaddle her comfortably and begin the session with some wrapped poses. We visited Tinaâ&#x20AC;&#x2122;s Instagram feed and gathered some of our favorite captures. Follow her at instagram.com/tinakraftsphotography/ to see more beautiful imagery! #NAPCPGREEN Some of our favorite images from the March @NAPCP tag on Instagram. Stay tuned for our April tag and keep tagging #NAPCPGreen for your chance to get featured in our feed! NA P C P G AT H E R I N G S Join us the week of April 22nd - April 28th for our thrid annual NAPCP Photo Walk! As creatives, sometimes we need to do something to re-charge our batteries and reset our minds. Take this time to chat with photographers in your area and enjoy experimenting and getting creative with one another. Donâ&#x20AC;&#x2122;t forget to tag @NAPCP and use the hashtag #NAPCPPhotoChallenge so we can see your work! New locations coming soon - stay tuned! M I S S T HE SUMMIT ? At our 2018 Marketing Summit in January, we welcomed 2018 with open hearts and minds. If you missed out on the marketing summit, you can still take this ride with us and make every month fulfilling and incredible. Get after it! Visit the NAPCP Store for all the marketing materials we used at the summit. We know youâ&#x20AC;&#x2122;re going to love every piece! Watch the videos, fill out your marketing binder, and get everything you need for a successful 2018! NOW AVAILABLE IN THE NAPCP STORE! Priorities and Productivity, with Free Printable! I have a confession to make: I’m not always very productive. Now, before you start imagining me laying on the couch all day watching soap operas and eating bonbons, let me clarify: I’m always busy. I’m just not always productive. There are many different things that I need to accomplish through out the week, and sometimes I just have a hard time prioritizing the things that need to get done over the things that can get done. It’s a problem I’ve had forever, but one that seems to have become ever more pervasive as my roles in life have multiplied and expanded… I’m now a mom and wife, the boss lady of the home front, and the girl behind the camera at Erin Fisher Photography. Meet Erin Fisher: Erin is a Hawaii natural light, lifestyle, family photographer specializing in family shoots, events, and military homecomings. A Home Office for DIY Inspiration The busy season is fast approaching, photogs — It’s time to get organized! The first place to start? Here! Today Rya Duncklee, of Rya Duncklee Studios, is sharing her stylish DIY home office to get you motivated to clear and tidy your own work space. Keep reading for a look at Rya’s new space! Read more. Meet Rya Duncklee: Rya is a full-time professional child photographer working in Florida. Her work is known for it’s fresh, airy look and her children’s portraits are often called whimsical. Rya has been published nationally and is a NAPCP award recipient. What to Wear: Spring Portrait Sessions Spring is around the corner, and pastel colors are everywhere. We can’t go anywhere without seeing a peek of serenity or rose quartz, whether it’s a department store display or a wedding party. NAPCP readers know we’re inspired by Pantone’s colors of the year! If you’re looking for more spring inspiration to inspire your spring photo session — whether for your own family, or for a client — we’ve got it! From papaya and electric green to salmon and mint … Read more. Meet Kate Lemmon: Based in Boston, Kate has been creating joyful, vibrant imagery for modern mamas since 2008. She loves to help her clients press pause on the endless BUSY and make moments that matter. # N A P C P I N S TA FAV E S The images of these amazing photographers caught our eye in March. Visit them on Instagram and follow along! Tag #NAPCP on Instagram and you may see your work in a future issue of Inspired.